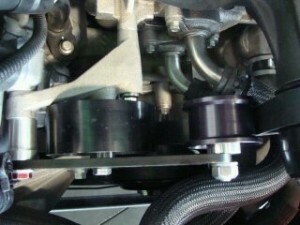 Several years ago, I began experiencing problems with the belt slipping on my 2000 S/C Saleen Series I. At the time I had Chicane's 66mm pulley and his 110 inch belt, which was very tight. Despite this, while on the dyno, I noticed that the belt was slipping back and forth so bad it was hitting the radiator hose and a bolt that was holding the bracket on. In response, I created the MoSaleen™ Idler Pulley System. Following installation, the car saw a difference of 34 rwHP and 42 rwTQ on the dyno. This occurred at the same air to fuel ratio of 11.9 to 1. I began offering the pulley system to other Saleen owners and the results continue to impress everyone who installs it. This MoSaleen™ Idler Pulley System is made of metal using grade 8 bolts and a high performance sealed bearing idler pulley. Several different finishes are available for the bracket and spacers, including powder coating in most colors or ceramic coated (tumbled to look like polished aluminum). 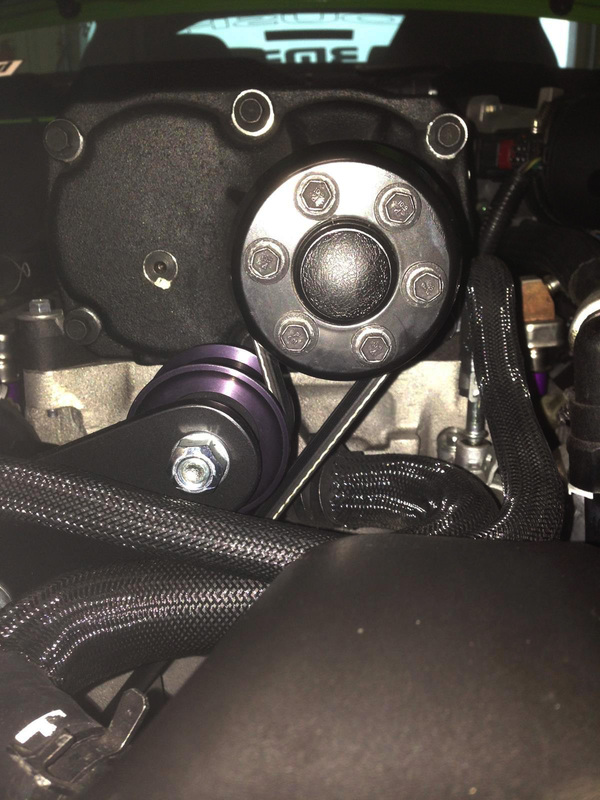 This pulley system is safe to use on a stock Saleen S/C, with a stock supercharger pulley and no modifications. It is HIGHLY recommended that you check your air to fuel ratio after installation to be safe. 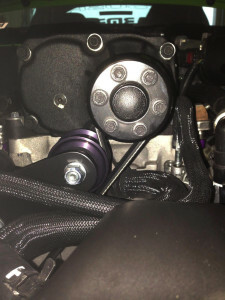 This is a MUST if you are using a smaller S/C pulley for added boost, or if you have other modifications. We do not recommend running more than a 12.0 to 1 air to fuel ratio on a supercharged Saleen. You should have a tuner device (like a X-Calibrator II) with tunes made for your car. 99-04 model Saleen owners can upgrade the black pulley included with the MoSaleen™ Idler Pulley Systems to a CNC aluminum anodized pulley. This upgraded pulley is available in a standard aluminum finish or anodized black. 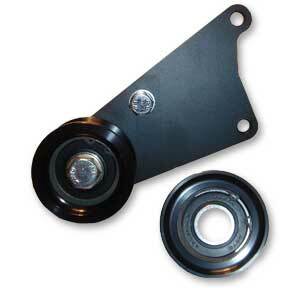 This MoSaleen™ Idler Pulley System is made of metal using grade 8 bolts and a sealed double bearing idler pulley. The system comes with a black plate. The CNC pulleys are available in aluminum or anodize black finishes. The sealed bearing in this kit is rated at 360 degrees and 12,000 rmp's. I use the system and to date my Saleen has 9000 miles on it with no issues. than the one you are using with your stock pulley system. This system is designed for aftermarket S/C pulleys, System 1, 2.75 to 3.20 - System 2, 3.40 to 3.60. You MUST retune following installation. We recommend having a dyno completed at JDM Engineering or Performance Auto Sport. They have tested this system and can set up your tuner device (like a X-Calibrator II) with the correct tunes for your car. 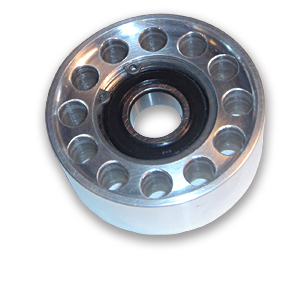 This Moboost Idler Pulley System is made of metal using grade 8 bolts and a sealed double bearing idler pulley. The system comes with a black plate. The CNC pulleys are available in aluminum or anodize black finishes.